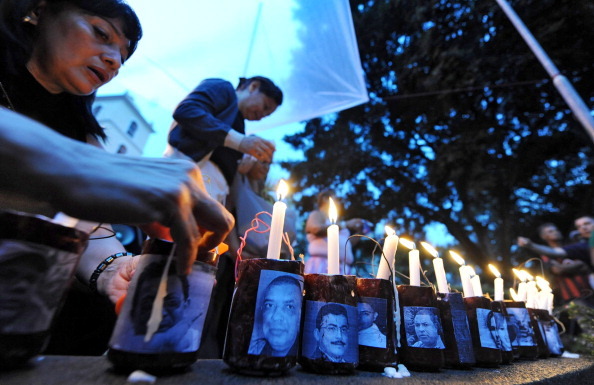 Honduran journalists take part in a vigil in memory of over 20 journalists killed in Honduras in Tegucigalpa, Honduras (Photo Credit: Orlando Sierra/AFP/GettyImages). 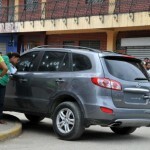 On April 11, unidentified assailants stabbed Carlos Mejía to death in his home in Yoro, Honduras. Mejía was the marketing director of Radio Progreso and a member of the Reflection, Investigation and Communication Team (Equipo de Reflexión, Investigación y Comunicación, ERIC). Both Radio Progeso and ERIC are Jesuit organizations known for their work defending human rights in Honduras. 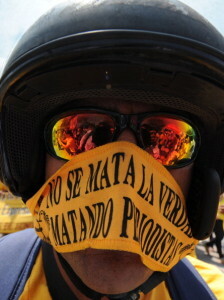 A man in a demonstration demanding punishment for the killers of journalists in Honduras (Photo Credit: Orlando Sierra/AFP/GettyImages). It is certainly not because of a lack of promising leads. Since the coup of 2009, the Inter-American Commission on Human Rights granted protective measures to 18 members of Radio Progreso. 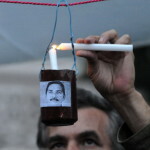 In 2011, the Commission specifically ordered authorities to protect Carlos Mejía’s safety. Nonetheless, the Honduran government failed to investigate the threats against Mejia and other members of Radio Progreso. Nor did it provide them with the protection ordered by the Commission. The logical first step in any murder investigation is looking into threats against victim. This would have been much easier and more effective, of course, if the Honduran authorities had fulfilled their duty to investigate the threats against Mejía and Radio Progreso. Their failure to do so, however, created impunity for whomever made these threats. 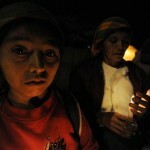 Now, the Honduran authorities are compounding their error by ignoring the most important lead in this case. The role of journalists and human rights defenders becomes even more important when the government fails in its duty to investigate abuses. Unfortunately, the impunity that makes human rights defenders so necessary also creates even greater danger for them. In this context, Carlos Mejía has become the latest in a series of media workers and other human rights defenders to be murdered in Honduras. Please take action and tell Honduran authorities fully investigate the murder of Carlos Mejía, wherever the evidence may lead. Please also tell them to provide protection for other members of Radio Progreso as ordered by the Inter-American Commission on Human Rights and to fulfill their obligation to ensure the safety of all human rights defenders. This entry was posted in Americas, Censorship and Free Speech, International Justice, Military, Police and Arms, Prisoners and People at Risk and tagged Americas, censorship and free speech, economic social and cultural rights, Honduras, human rights defenders, international justice, Military Police and Arms, press freedom, prisoners and people at risk by Larry Ladutke. Bookmark the permalink.